The main rule to keep in mind when driving in Italy is that there are no rules. Or rather, there are, just don’t expect anyone to stick to them. They are more like… guidelines. Which, much like those emanating from the European Union, are routinely ignored. This looks civilised. It’s Saturday lunchtime. Everyone is slightly drunk. 1. You don’t need eyes in the back of your head. You also need them at the sides, on your shoulders and if possible on swiveling antennae that can be extended out of the vehicle to get a 360° view of the situation at hand. Why? Vespas. Scooters. Motorini. They are EVERYWHERE and the rules of the road don’t apply to them (in their heads) so you need to keep your eyes peeled. All of them. 2. Trucks, busses, lorries and all-things-larger-than-you have right of way at all times. It doesn’t matter what the highway code says, they are right. They won’t get out of the way or stop, and since they are, by definition, bigger than you… don’t argue. 3. Safety space is not safety space in Italy. It is the space that idiots leave between them and the car in front to allow other, smarter people to overtake and save an entire 0.000000000003 seconds off their journey to the supermarket. 4. Parking more than about 100m away from where you need to go is unheard of. People will park alongside you in the road, stopping you from getting out and reducing a two or three lane road to one lane because the idea of having to walk to the greengrocer from the next street up is absurd. 5. If there is space to park however, there is no need to worry about parking properly and allowing others to take advantage of this unusual situation. Common practice is to attempt to take up as much space as possible, with first prize going to the man in the SmartCar who managed to park across three spaces, taking up more room than a SUV. I need to work out how to take part in this competition somehow. 6. Speed limits are ridiculous. Some of them are unreal. 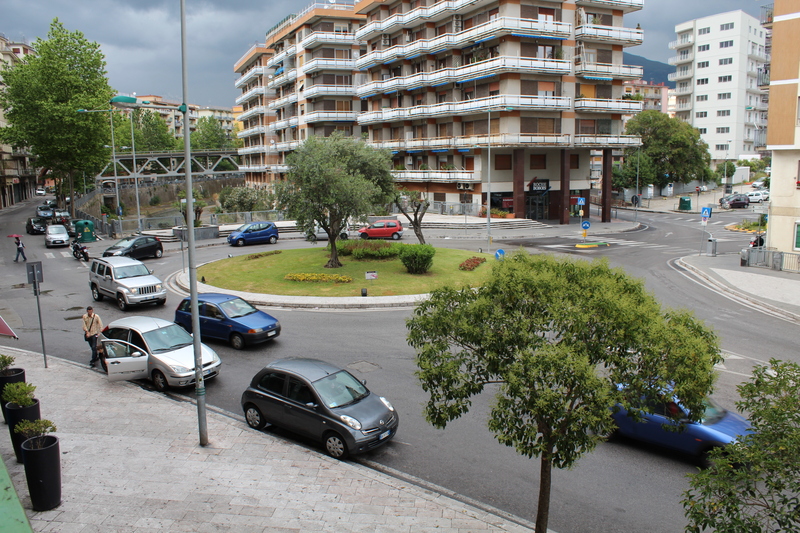 There are residential areas near kid’s playparks where the limit is 50 km/h then three lane motorways where the limit is 60km/h (lookin’ at you, Napoli-Salerno). WTF? The best advice I can give is use your common sense, and look out for speed cameras. And stray children. 7. At a junction, if you wait politely for a space or for someone to let you out, both you any any unfortunates stuck behind you will get old and possibly die of hunger and thirst before any of this happens. This does not mean to say you should dart out recklessly (although some people do and you need to keep your eyes peeled for them) but it does mean you shoud inch out little by little until someone has little choice but to let you out. They might shout and make rude gestures at you, but they don’t really mean it. It’s all part of the fun. 8. Which brings me to my next point. They will shout. Scream. Make obscene gestures. Go red in the face with rage. Don’t worry about it. You probably just made them miss ten seconds of auntie Addolorata’s birthday bash. 9. Especially if you are American, the roads will seem much narrower to you here. They are. The cars are also much smaller. Don’t sweat it, you can fit, I swear. The only time I ever saw someone get stuck in a narrow street was in the historic centre of Bergamo. He had bought himself a Hummer. I have no idea why. On some narrow windy roads you will see mirrors. Use them, they are there to tell you if there is something coming in the other direction. 10. Scratches on the car are not a tragedy. New cars often get their first scrapes with weeks of leaving the shop floor (I know mine did) and if you leave them parked on the street you will find that they will have a good few scuffs and several door dings by the time they reach two years of age. If you are the type of person who can’t handle this, shell out for private parking: it’s the only solution. If it’s a rental, before photos will protect you from previous damage, while the rental company probably wont give a flying fart about a new minor door ding (a full on crumple is another matter of course). If you still feel brave enough to drive here, go ahead. Relax. Enjoy the adventure… and remember, if you are driving around Naples… it’s not a Fiat 500, it’s a Batmobile. Hysterical! I will stick to taxis! Driving in Spain was bad enough for me!!! Spain, Italy… in terms of driving I don’t think there’s much difference 🙂 Taxis are definitely a good plan. Much safer, although more expensive.